Somewhere along the way, I have been conditioned into thinking carbs are the devil. Even worse – if I’m going to go down the road of enjoying carbs, I better not eat them at night! And although I don’t religiously observe this message, I had a hearty dose of mac and cheese the other night even though I only had salad on my plate, I try to keep to this during the week while eating at home as much as possible. Perhaps that’s part of the reason Passover was soooo do-able this year. This recipe is so delicious and glutinous feeling, that you don’t even realize that it’s low-fat. The even bigger bonus was that my 7 year old had four helpings!!!! Preheat broiler. Trim ends off zucchini. Cut zucchini lengthwise in to ¼ inch slices. Lightly coat both sides of slices with cooking spray; place half the slices in a single layer on a wire rack set on a large baking sheet. Broil 5 to 6 inches away from heat for 12 to 14 minutes or until lightly browned. Repeat with remaining zucchini slices. Reduce oven temp to 375 degrees. In a large skillet cook beef, mushrooms, and garlic until meat is browned. Drain off fat. Remove from heat. Stir the next five ingredients (through fennel seeds) into skillet. In a bowl combine egg and ricotta cheese. 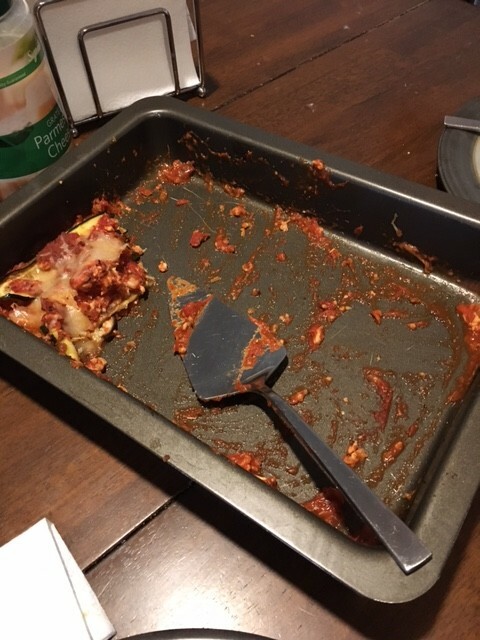 Spread 1 cup meat sauce in a 13x9 inch baking pan. 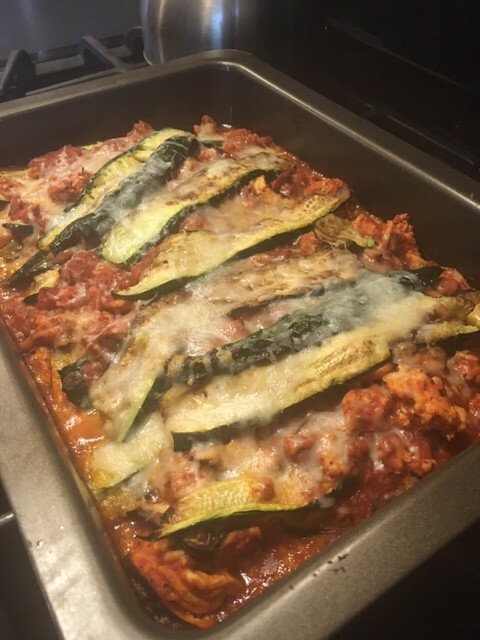 Top with zucchini slices to cover. Spoon half the ricotta mixture on zucchini; use back of spoon to lightly spread over zucchini. Sprinkle with ¾ cup of the mozzarella. Top with half the remaining sauce. Repeat layers, ending with sauce.